“Inner city” was always a loaded term, but today it makes no sense at all. But no matter how well this may play to white supremacists who believe that black people live wretched, crime-ridden lives, it simply doesn’t line up with the facts. First of all, about 50 percent of black people live in suburban or rural areas, not cities. Cities are getting whiter and wealthier. Home values have risen faster in big cities than anywhere else over the last quarter-century. “Inner city” was always a loaded term, but today it makes no sense at all. It harks back to an era when the Bronx was burning and black uprisings roiled many major metropolitan areas, while today, cities are improving by every measure, though often at the expense of black people. Consider some basic metrics. The unemployment rate is relatively low in the biggest cities; it’s 5.2 percent in New York, 5.1 percent in Los Angeles, 5.4 percent in Chicago, and 6.5 percent in Washington, DC. Even Detroit, where Trump has promised to bring back jobs, has an unemployment rate of only 6 percent. And they’re mostly safe, despite Trump’s law-and-order rhetoric, ripped straight from the 1970s. Crime has dropped dramatically in the country’s largest cities, more quickly than the overall fall in crime that the country has seen over the last two decades. Certainly gun violence continues to be a problem, and it’s particularly concentrated in some urban places like Chicago, where black people are its frequent victims. But you are less likely to get shot while walking down a city street today than you were 20 years ago. 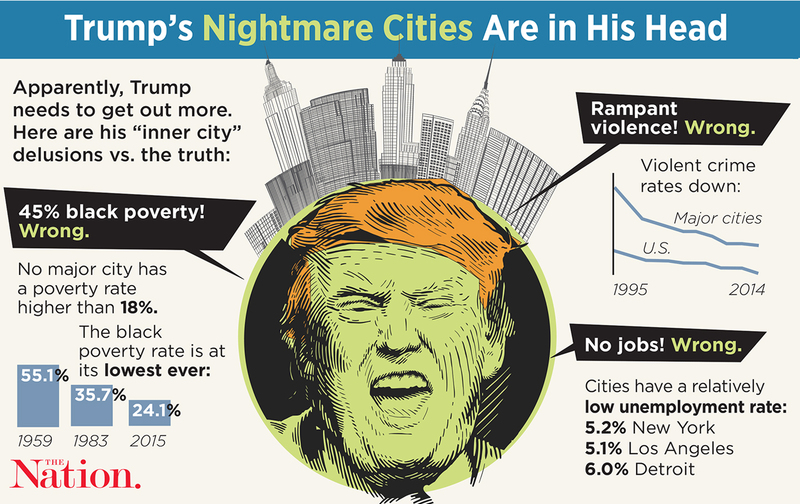 For Trump, inner-city dwellers and African Americans are basically interchangeable. But are black communities in “the worst shape that they’ve ever been in before, ever ever ever”? First, set aside the fact that nothing has been worse than more than 200 years of chattel slavery. Then consider the important, though incomplete, gains for African Americans over the last half-century. Black Americans do, in fact, have education. The share of black Americans over the age of 25 with at least a high-school diploma was more than 87 percent last year, a big increase since 2003; the same is true for the share with a college education, which increased from 17.5 percent in 2003 to nearly 23 percent in 2015. They also have jobs. The unemployment rate for black Americans is 8.3 percent, and while it’s much higher than the 4.4 percent rate for whites, it’s far lower than the recent 16.8 percent rate it hit during the recession and much, much lower than the 21.2 percent peak it hit in early 1983. While the poverty rate is higher in cities than in the suburbs, no major metropolitan area had a poverty rate over 18 percent as of 2013. Black Americans experienced a poverty rate of 24.1 percent in 2015—much higher than the 9.1 percent rate for whites, but nowhere near 45 percent or the sky-high 55.1 percent rate back in 1959. When Trump paints this dire picture, he’s not really talking to black people, despite promising to reach out to black communities. It’s clear in his use of the word “they”—never “you” or “we.” Instead, he’s talking to a base of supporters who seem more comfortable with stereotypes of “inner city” black life than with black Americans’ 2016 reality.